‘What if we live in a world full of colours?’ asked Specky, my wife, after reading my interpretation of a composite novel. I simply quoted from the novel: ‘It is a novel whose chapters are in distinct shades of vibgyor arranged to create the magnificent rainbow…’ and then added, ‘Well, you dabble in colour, obviously.’ Definitions are entirely up to us to formulate and everything depends on how fast and how unimpeded we let our imagination run. I do ask the readers of this review to read the stories and see if the concept of a composite novel has worked or not. I think it has… and so does Siddhartha Basu, the Quiz master we know so well, who specifies that ‘each story is a unique adventure for the reader, yet criss-crosses and knots into the weave and weft of the next, each with a different design and texture, never predictable, always surprising, and yet quite a whole’. With such an endorsement, I need not even give you a bird’s eye view of what each story is all about or how well it manages to thrust into your mind and squeeze out the expected and the obvious to make you relish the unexpected with aplomb. I remember getting completely absorbed in the diary of Joseph Varughese and almost expecting the unexpected twist because this is precisely how Sutapa Basu’s story that came in earlier has primed your subliminal process. I mean, you are still reeling with the thorough crime that the mild Sudip has just executed because what the protagonist there has accomplished has still ‘not sunk in’. And so we go on from one story to another expecting to be buffeted and thrown about and flung on to corners and spaces where nothing but the fabulous craft of story-telling resorts to ‘cooing, drooling, crying, and demanding antics’ to ensure that you neither sleep nor eat before you’ve actually finished reading the final word of the final story. Each story is admittedly a battle waiting to escalate ‘into a global situation where the exact enemy was hazy’, is sometimes like a despondent Binoy who ‘battled her tears and giggled to cover them up’, or becomes a Kamu coming in ‘like a whirlwind and swoop down on’ sensibilities and make readers wonder at the wonder of stories that read as separate individuals yet connect to the others in the collection like glaciers in a region raising streams that come together finally as a majestic river flowing to yet another point of convergence! There have been many times when I have read short stories in anthologies that made me sit up and wonder at the sheer length and breadth of emotions that they seem to interpret… but this composite novel does it in an entirely different way. You know you have a lock to be opened and you have a set of fourteen keys. You know each key is doing a particular job and you soon enough know that the lock would open once you’ve used all the keys given. The surprise is that you not only open this lock but also a number of other locks that are lying closed in your sub-conscious… yes, the stories slowly and surely ooze into the deepest layers in your conscious and unconscious self to unlock what has been lying discarded as you didn’t know what to do with those mysteries. The stories, in short, are all solutions to mysteries of life and as you finish reading each of them you raise you head to mumble, ‘Here is another mystery solved!’ Yes, all those shadows riding on your being are finally swallowed by the sky that a composite concept like this one manages to create. When was the last time I read a short story cycle or a collection of closely linked stories where the narratives were arranged to create a uniquely different and edifying literary experience? Sifting through the pages of Crossed and Knotted, published by Readomania, I discovered the pleasures of reading a composite novel – the first such attempt in Indian writing in English. I savored the unique experience of reading separate stories woven together to form an intricate tapestry. Adding to the pleasure of reading individual stories was discovering the connection between them. Reading the book was the equivalent of stumbling excitedly across a rich and diverse kaleidoscope of human emotions. In classic English literature, we have a few remarkable examples of fiction where disjointed tales have been grouped together into fragments which are connected meaningfully, beginning with Chaucer’s Canterbury Tales. In the early nineteenth century, we see apparently dissociated stories in James Joyce’s Dubliners (1914). Those are narrated by child protagonists and also by progressively older people, all of them coming together in the end to form a unifying thesis on Joyce’s idea of his epiphany or his life-altering self-illumination. Later, in J.D. Salinger’s Nine Stories (1953), in the Nobel prize-winning Lives of Girls and Women (1971) by Alice Munroe and also in the recent Pulitzer-prize winning ‘A Good Scent From a Strange Mountain’ (1992) by Robert Olen Butler, we experience a cycle of richly narrated stories chronicling the life of a single protagonist or narrated by multiple narrators to unfold greater truths about society and humanity. In the book The Composite Novel: The Short Story Cycle in Transition’, the authors Maggie Dunn and Ann R. Morris have stated that the composite novel can be defined as a literary form where shorter texts, individually complete and autonomous, are interrelated in a coherent role. They reflect on its 200 year-old history starting from its humble origins of village sketch traditions to the more experimental narratives of the nineteenth century English authors. They also add that this flexible form, which welcomes multiple perspectives of thinking and narration has also been criticized and misunderstood as a literary genre. However, they strongly argue that this rich form and genre has produced literary masterpieces, especially by nineteenth century women writers who produced them as more creative alternatives to linear narratives, while expanding the limits of literature. 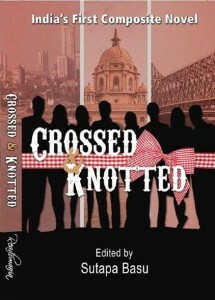 In Readomania’s composite novel Crossed and Knotted, the fourteen writers were faced with the challenge of achieving a unique feat while creating a well-balanced storyline that comes together like a rainbow. They had to juggle with the individual characters, events, settings and emotions of the individual narratives, very much as their literary predecessors had done. However, what we see in effect is the experience of tying and untying a beautifully created knot, with the separate strands of unique and seemingly disparate stories. In other words, we explore the formation of a braid, which is meticulously woven with every individual story that is complete in itself, yet connected with the story that follows, ultimately giving the book its multiple layers and nuances. The unmistakable appeal of the book lies in its smooth dexterity in the way the stories weave in and out of each other, connecting one narrative to the other with each individual authors distinctive flavor of storytelling. As we journey through the pages, we see how each individual author tackles the mammoth task of taking cues from the previous story while adding a unique narrative dimension of his/her own. In this exciting and unforgettable roller-coaster journey, readers are amazed by the revelations and suspense unfolding in multiple layers in each story. The process of tying the individual stories becomes even more intriguing and complex task due to the challenging diversity of the settings that span cities, countries and continents against the vast expanse of the time as the characters grow from infants to adulthood and beyond. In the first story of the cycle, ‘A Curious Dalliance’ by Sutapa Basu, we see the vulnerability and deep, psychotic layers of Sudip Ray when his wife Megha dies a painful death behind the bolted doors of the hospital room. While he becomes a passive onlooker surrendering to the inevitability of his wife’s death, the narrative takes a reverse leap, going back years in time. The flashback leads to Sudip’s marriage to Megha and the years that followed conveying the gripping tension and conflict in his life that pushed him to the point of making deliberate, life-changing choices. The undercurrent of tension intensifies with the second story ‘The Diary of Joseph Varughese’. The storyline fast-forwards a few years when Sudip’s grown up daughter Shivi flips through the pages of a mysterious diary that has unknown, unidentified roots. The stories that follow, including ‘The Web of Life’, the eerie and intriguing ‘The Real Fiction of Illiana Braun’, and ‘A Burning Candle’ take curious turns and bends, in a mission to discover and explore the roots of the diary and to identify the missing links of the overarching plot and sub-plots. In the stories, each of the characters and their interpersonal connections are established through vividly descriptive scenes, unfurling the deep-rooted human emotions of love, betrayal, dilemma, courage, hope and resilience. The plethora of characters are neatly etched out including Sudip, his daughter Shivi, her journalist friend Siya, Siya’s American friend Catherine, the mysterious Illiana Braun, the tormented Jamila and her daughter Ruksana, the vivacious Dimpy, the star-crossed couple Aditya and Meena. These characters develop and evolve over the course of the entire novel through an extremely creative and collaborative process. The stories that follow branch out in diverse directions, sometimes defying temporal linearity. The narrative jumps back and forth in time across the expansive Lodhi Gardens in Delhi and the war-ravaged Afghanistan, from the air crashes in South India to the devastating bomb blasts in Mumbai that rip apart the hopes of the living, rewriting the destiny of an individual in another city, as he forges newer connections. Towards the end, we come close to identifying the unusual and unique twists and turns in the plot. We also discover that the conflicts brought out to the surface in the beginning are resolved in the final story, ‘The Last Act’. Here, Sudip, the protagonist of the first story is confronted with the demons of his past and also with the characters in his present life. They form a mosaic to bring him closer to his catharsis and his salvation. 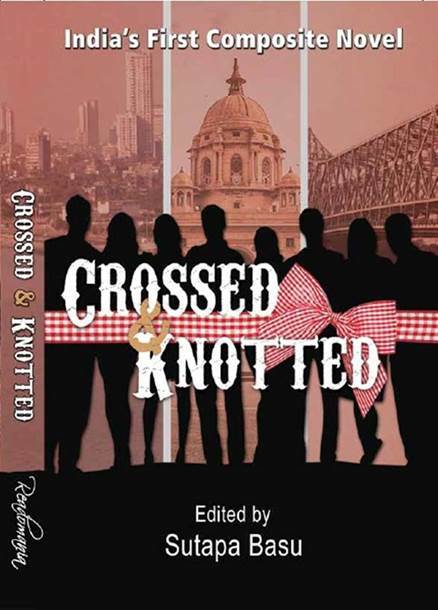 When the first story of ‘Crossed and Knotted’ unfolds, we hardly have an idea how it will connect with the next story and then the next. But the chain continues to unfold an emotional, wonder-filled tapestry. On reaching the final story that interwoven with the narrative of the first story, we discover the complexities of memorable storytelling. The appeal lies not only in the collection’s unique language and storyline, but also in the complex, tangled and multilayered plots and sub-plots that convey to the readers the deepest, darkest secrets of the characters, all of whom are real, humane, vulnerable and individual at the same time. Alongside, the narrative traverses countries, generations and most importantly, time, the mysterious fluid entity. The publisher of the book, Readomania, started off as a social networking platform for budding authors and discerning readers; as a vibrant community of authors, editors sharing stories and poems; an explorer of creative talent from around the world. 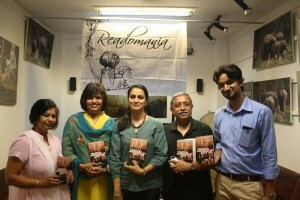 On their website, Readomania not only publishes quality content, edited and structured by the team of editors, but also promotes collaborative writing.